This article is a step by step breakdown on Mailgun setup and integration with the HQ system. 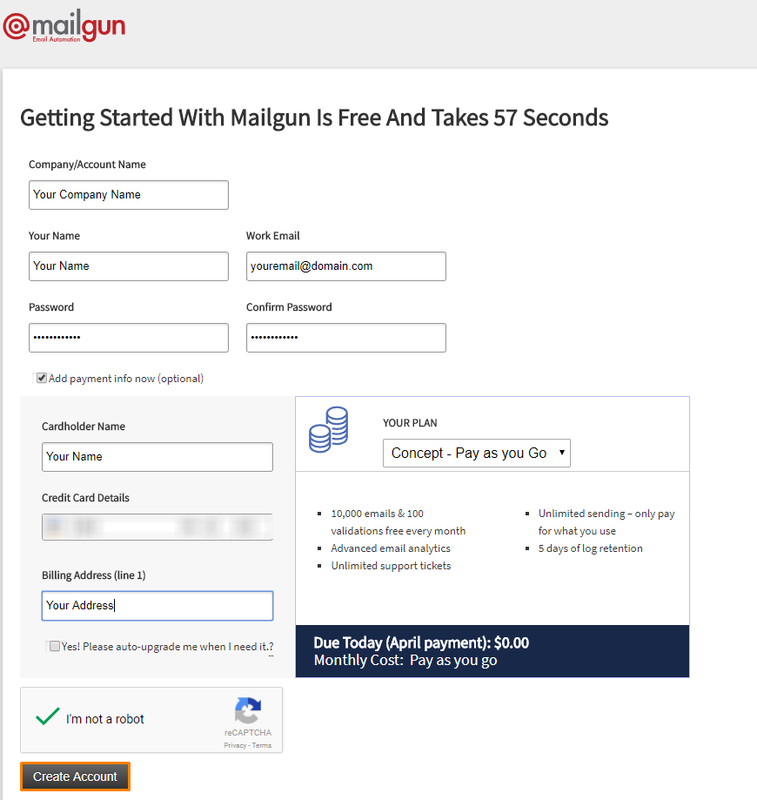 Go to https://signup.mailgun.com/new/signup to sign up for a new Mailgun account. Once you have done entering the details, select the payment type depending on your needs. Next, click on the black “Create Account” button highlighted in orange in the picture below. You can skip this step and log in to your Mailgun account at https://app.mailgun.com/sessions/new if you already have an account. 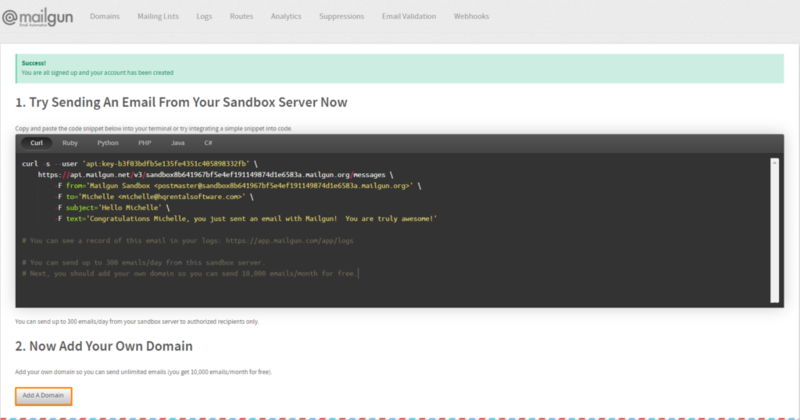 The next part is to add your domain to Mailgun. If you have just signed up, you will see the “Add a Domain” button highlighted in orange in the picture below. If you had already created your account beforehand, you will be on the dashboard page, click on the “Domain” tab highlighted in orange in the picture below located on the top of the page. Next, click on the black “Add New Domain” button highlighted in orange in the picture below. Once you have clicked on the buttons, a new page will appear as in the picture below. It is important to note that to do this you must have a domain that you own. If you do not own a domain and would like help with that, you can contact us at [email protected] with the message titled “Purchasing a Domain for Mailgun – Your Company Name”. In this email, include the domain name that you would like for your company. If you have your own domain, enter it in this format “mg.yourdomain.com” and click on the black “Add Domain” button highlighted in orange in the picture below. After you have clicked the “Add Domain” button, it will take you to a “Domain Verification page”. This step will require a somewhat advanced knowledge of your domain. You will need to follow the steps on this page to set up the domain. Once you have finished following this step, click on the black “Continue to Domain Overview” button highlighted in orange in the picture below. This next step can only be done once your domain has been verified. In the tracking settings, highlighted in orange in the picture below, set the “Click Tracking” and “Open Tracking” to “On”. Next, login to the HQ system and navigate to the Integration section in the settings. Enter in these 3 details in the picture below. Mailgun Sender, this can be any username that you would like for example “reservations”. 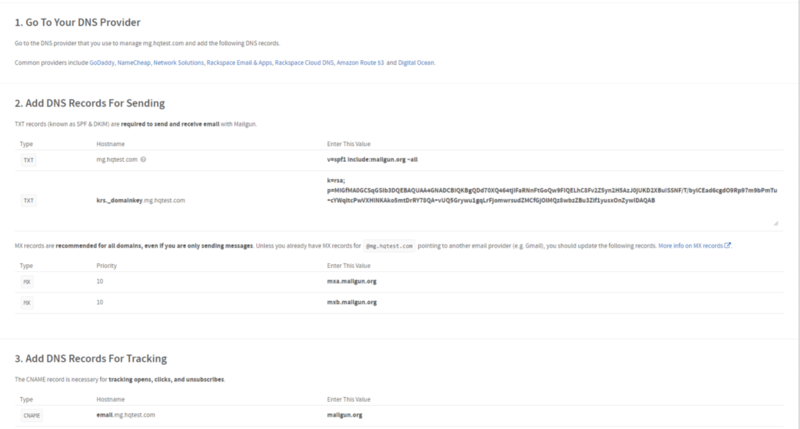 Next, Mailgun domain, this is the domain that you have entered in step 2 which is the “mg.yourdomain.com”. Lastly, Mailgun API Secret, this is the API key which you can find highlighted in orange in the picture below located in the Domain information section in Mailgun. In Mailgun, navigate to the “Webhooks” tab located on the top of the page highlighted in orange in the picture below. Here you will need to insert links into the different webhooks as shown in the picture below. For your convenience, here is the list of links. If you have any questions or need help with the setup, you can open a support ticket. You can learn how to create a support ticket here and a representative will get back to you within 24 hours once you have created a ticket.